Over a countless number of times I have raved about how much I love Statement Necklaces and even written a post on how to wear them. Currently, they are my number one accessory to wear with any outfit and are perfect for dressing up an outfit for being too boring, or making a evening dress even fancier. 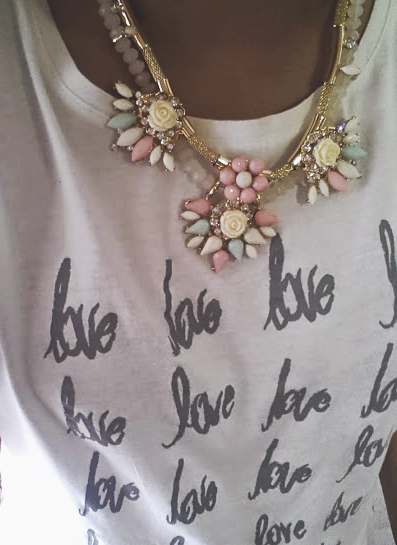 I have a lot, but this necklace* has to be my favourite of them all. 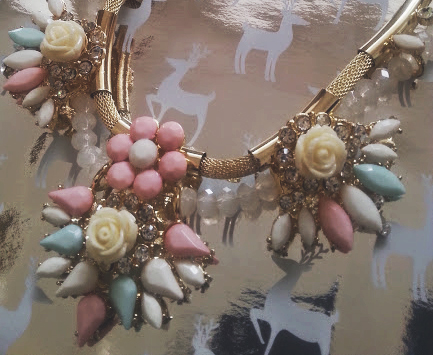 This Stunning Mikey Necklace is just one of many that House of Fraser have on offer, and to top it all off it is only £24! A great deal and it looks a lot more expensive. The main reason why I love it is because of the colours and the design. A lot of necklaces are super heavy and your neck feels like it is being held down by a weight, but this is surprisingly light and easy to wear. It's also very chunky and this makes it easier to wear as you can pair it with anything, the best thing is to always pair it with something of a similar colour to the necklace or something contrasting. On of the unusual things about this necklace is that it has two straps. Weird? Yes. Amazing? Yes! It is something very unique and looks gives it that chunky look. 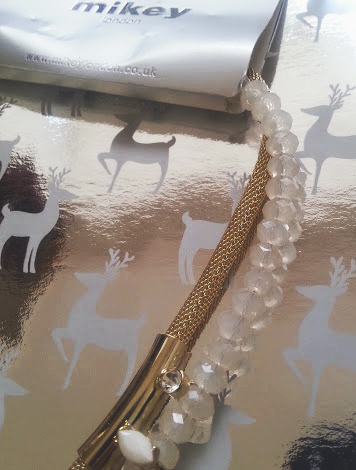 I would never think of putting a gold chain with clear crystals as it is a very odd combination but works well. The gold makes it elegant and the crystals makes it dainty and cute. Now for the show stopper! The main part of the necklace the flowers! I think that Mikey have choses such beautiful colours to put on the necklace and having three doesn't make it look over the top as well as the two roses and then flower create a pretty pattern. Then to finish it all off, there are small gems around the roses in the middle which gives it a nice shimmer! 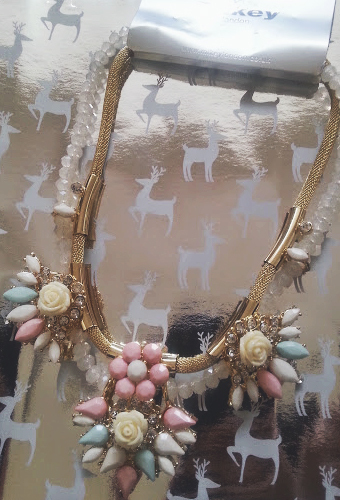 I have fallen in love with this necklace, will be wearing it for Christmas Day and New Years Eve! You can order this necklace TODAY (23rd) in time to wear for the big day or even give as a gift! Find out more about House Of Fraser's Delivery Rate HERE. Buy the necklace HERE, and be sure to browse through the site and check out others that are available they are very affordable!